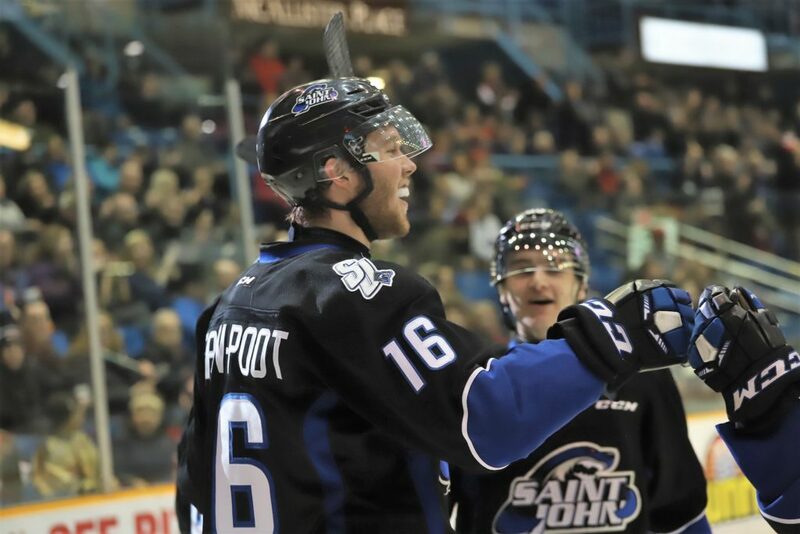 The Saint John Sea Dogs completed a thrilling comeback on Saturday night at Harbour Station downing the Charlottetown Islanders 6-5 in OT. Nicholas Deakin-Poot scored a hat-trick that included the game tying goal with just over a minute to go in the third. Filip Prikryl would then go on to score the game winner in overtime on a beautiful deke. Saint John improves to 12-36-2-2. The Sea Dogs came out with some pep in their step while the Islanders were playing their second in as many nights. Maxim Cajkovic opened the scoring at 4:17 of the first period, his team leading 16th of the season. Benjamin Gagné let a blast go from the blue line and Cajkovic was able to get a stick on it to fool Isaak Pelletier. Anaheim Ducks prospect Hunter Drew let a floater go from the blue line that went completely unseen by Sea Dogs net minder Zachary Bouthillier to tie the game at 1-1 at 16:22. Maxim Cajkovic thought he had his second of the night with under a minute to go in the first but his top corner snipe was called back after the play was deemed to be offside. Deakin-Poot would correct the call seconds later after play resumed and he slipped a wrister five-hole to give Saint John the lead heading into the second period. Thomas Casey opened the scoring for the Islanders in the second period, their first of three in the frame when he lifted a back hand high over a sprawling Bouthillier to tie it at 2-2. Less than a minute later Jeremie Poirier added his fifth of the season when he completed a nice tic-tac-toe feed from Filip Prikryl to put the Sea Dogs back up by one. Charlottetown then scored two straight on goals from Jordan Maher at 15:12 and Liam Peyton at 18.59 to close out the second. The Islanders led shots on goal 22-14 heading into the third. Hunter Drew added his second of the game on a power play marker at 4:10 of the third putting the Isles up 5-3. With under four minutes to go in the game Nicholas Deakin-Poot scored back-to-back goals including a hard rush to the net to tie the game at 18:41. These were Nick’s 13th and 14th goals of the season, and his first career hat-trick. In overtime Jeremie Poirier chipped the puck forward for a Filip Prikryl breakaway and Prikryl would slip the game winner five hole on Pelletier to complete the comeback and give Saint John the 6-5 OT win. Josh Lawrence and Benjamin Gagné finished with two assists each. Jeremie Poirier added a goal and two assists. Zachary Bouthillier stopped 35 of 40 for the win. Rookie net minder Isaak Pelletier stopped 19 of 25 in the loss.